180 daily teaching lessons are in each level. Independent learners can work a lesson and review the answers with the parent. 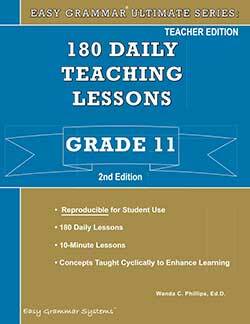 The parent can do a lesson with the learner who needs step-by-step instruction. Concepts are taught and build upon one another in a spiral approach. 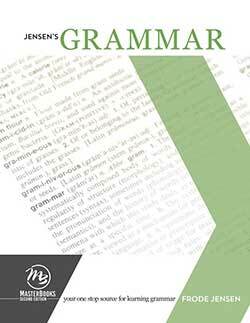 Provides daily review of various grammar topics. 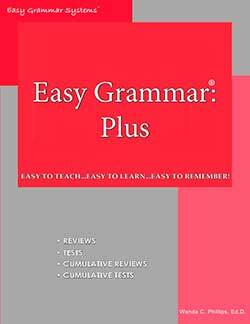 Where are the answers to Easy Grammar Ultimate Workbooks? Each teacher book has answers in the back of the book. Has no answers in it. Or you can use it as consumable tests for one student. 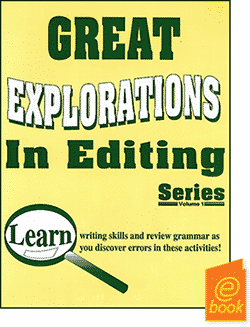 The Easy Grammar Ultimate Teacher’s Guide Grade 8 has the reproducible student pages. The answer key is in the back of the book. 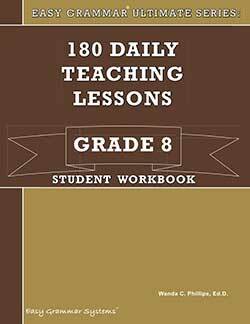 Used in conjunction with the Teacher’s Guide, the Student Workbook 8 has 180 daily teaching lessons. It does not contain the answer key. 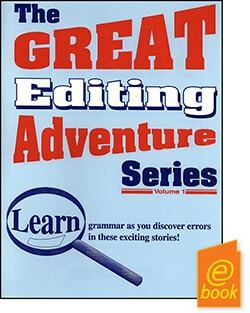 Use it for extra students and when you don’t want to copy the pages. 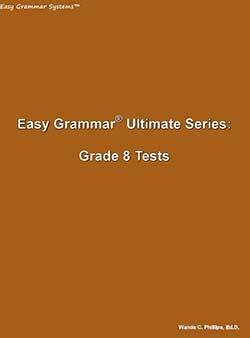 Reproducible for student use, the Easy Grammar Ultimate Tests Booklet is now available separately. 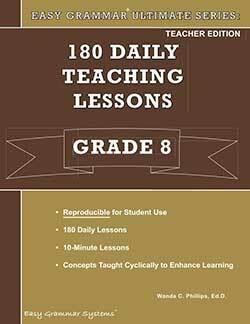 It’s your choice to reproduce it or use it as a consumable test for one student–if you don’t like making copies and want to keep the tests together in one place. 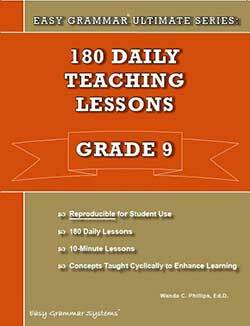 The Easy Grammar Ultimate Teacher’s Guide Grade 9 has the reproducible student pages. The answer key is in the back of the book. 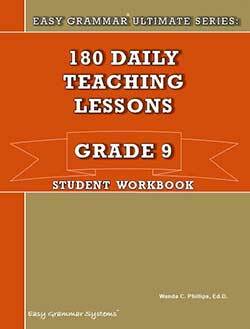 Used in conjunction with the Teacher’s Guide, the Student Workbook 9 has 180 daily teaching lessons. 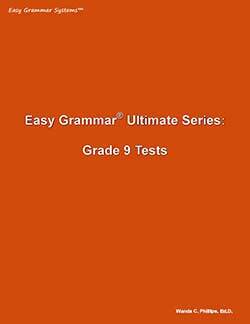 Reproducible for student use, the Easy Grammar Ultimate 9 Tests Booklet is now available separately. 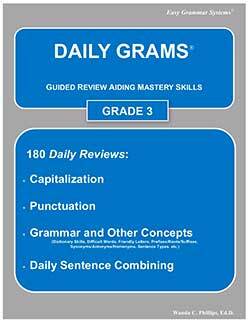 The Easy Grammar Ultimate Teacher’s Guide Grade 10 has the reproducible student pages. The answer key is in the back of the book. 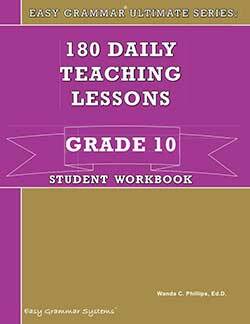 Used in conjunction with the Teacher’s Guide, the Student Workbook 10 has 180 daily teaching lessons. 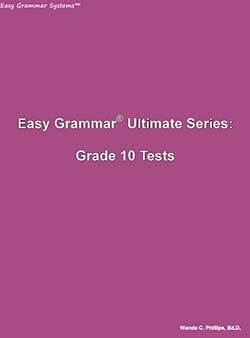 Reproducible for student use, the Easy Grammar Ultimate 10vTests Booklet is now available separately. The Easy Grammar Ultimate Teacher’s Guide Grade 11 has the reproducible student pages. The answer key is in the back of the book. 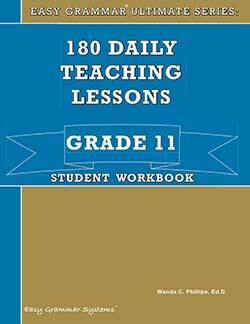 Used in conjunction with the Teacher’s Guide, the Student Workbook 11 has 180 daily teaching lessons. 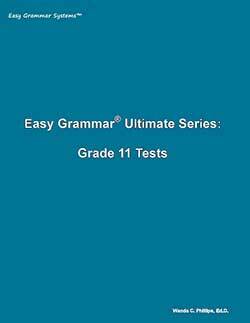 Reproducible for student use, the Easy Grammar Ultimate 11 Tests Booklet is now available separately. 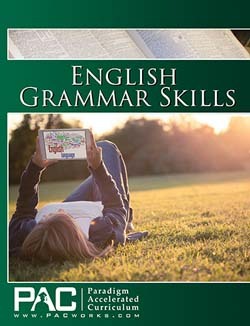 The Easy Grammar Ultimate Teacher’s Guide 12 has the reproducible student pages. The answer key is in the back of the book. Used in conjunction with the Teacher’s Guide, the Student Workbook 12 has 180 daily teaching lessons.